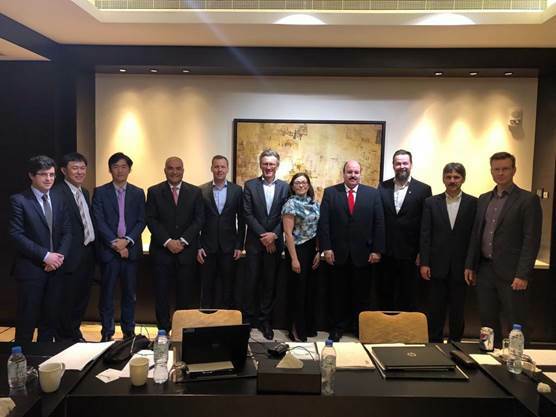 MacGregor, part of Cargotec, is one of a consortium of leading marine industry players that have signed an agreement to collaborate in developing new levels of performance and environmental efficiency for container vessels. The consortium, which is led by Dubai-based Zaitoun Green Shipping L.L.C. (ZGS), also aims at creating a new business model for the container sector. The seven companies that make up the consortium are each established experts in their own fields. MacGregor, as a leader in intelligent cargo handling solutions, brings its expertise and know-how in how to maximise the earning potential of container vessels. "The industry has a lot of potential particularly stemming from underperforming systems and processes," says Tommi Keskilohko, Director, Customer Innovations, Cargo Handling, MacGregor. "For this collaboration project, we can offer a great deal of experience stemming from our own commitment to increase the efficiency of cargo handling. The MacGregor PlusPartner concept is helping customers to maximise the cargo carrying capacity of containers on board their vessels, which makes assets more profitable and eco-efficient. "We need to put the cargo back on the centre again," Mr Keskilohko continues. "We are happy to join this consortium where each member company has an important role to play in developing and building a state-of-the-art container ship." In addition to ZGS and MacGregor, other consortium companies are Wärtsilä, a global leader in smart technologies and complete lifecycle solutions for the marine and energy markets; Gaztransport & Technigaz (GTT), engineering company expert in containment systems with cryogenic membranes used to transport and store liquefied gas, in particular LNG (Liquefied Natural Gas); Carina Solutions (C4), a specialist company in project management and supply chain processes; Winterthur Gas & Diesel (WinGD), a leading developer of low-speed 2-stroke engines; Mitsubishi Heavy Industries Marine Machinery & Equipment (MHI-MME), a provider of energy saving and environmental solutions.